Each maria severyna design is lovingly crafted just for you. These pants are not only a high fashion statement. They are also the most comfortable pair of pants you will ever wear. 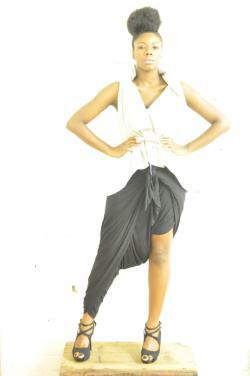 Beautiful drape along the length of one leg and shorter drape on the other. Asymmetric design that is a conversation piece. Front ties and elastic in the back. Every maria severyna design is simply timeless and loved by many fashion "buffs" around the world. We happily offer a lay away plan for all of our designs. Feel free to ask any questions you may have about sizing. It can be made for you in extra small small medium large or extra large. Best of all each item is crafted right here in new york. The fashion capital of the world. You can also give us your dimensions in inches or cms and we will make it fit just as you like.